Between 6 and 12 months your baby goes through a rapid stage of growth and development. 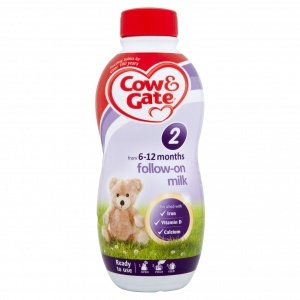 Cow & Gate follow-on milk provides more of the key nutrients needed to support your baby's food diet from 6 months, with iron, to help support normal cognitive development, and calcium and vitamin D for normal bone development. *Assumes weaning at 6 months. † pint (500-600ml) per day from 6-12 months of age. This information is given as a guide only. Consult your healthcare professional if you require more advice. 2 Shake the bottle of Cow & Gate follow-on milk before opening. Using the feeding guide, pour the required amount of follow-on milk into a sterilised beaker. 3 Cow & Gate follow-on milk can be given at room temperature, or warmed if desired. If warmed, check temperature of feed. For hygiene reasons, discard unfinished milk in the feeding beaker as soon as possible, and always within 2 hours. Not got time to prepare powdered formula? Ready-to-feed milks don't need any preparation. Just pour them straight into your little one's sterilised beaker. Also available in handy 200 ml bottle. Once opened, unused follow-on milk in this 1 litre bottle must be refrigerated immediately and used within 48 hours.